Carol Super's popular book "Selling Without Selling: 4-1/2 Steps to Success" published by the American Management Association's AMACOM Press shows salespeople, sales managers and CEOs how to be far more successful (and far less stressed) with her proven process of breakthrough strategies for accelerated business development. "The lively, energetic narration will keep listeners interested in Super's ideas. Highly recommended for all public libraries and university libraries supporting a business curriculum." Also available: A CD-ROM version of Carol Super's Seminar. If you can't make it to one of Carol's powerful in-person seminar's, then begin increasing your sales potential at home with this CD-ROM. For more information, contact Carol today! 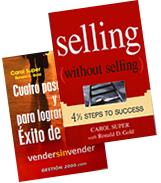 "Everybody should read Selling Without Selling: 4½ Steps to Success! It's certainly not just for sales people. I learned something great on every page. It took the fear out of cold calling. It teaches a whole new positive approach to sellingï¿½ how to get rid of bad habitsï¿½ and how to sell with passion. I enjoyed the unexpected, insightful quotes from Woody Allen, Donald Trump, Yogi Berra and so many othersï¿½including your mother! I honestly loved every second of it and have been recommending it to everyone it know. It's easy for me to see why [Carol Super was] named America's Sales Professional of the Year." "Selling without Selling: 4½ Steps to Success! is an intimate and revealing examination of the record-setting sales techniques of 20-year sales professional Carol Super. Through a deceptively simple "how to" approach, Super shares her secrets of the art (and science) of selling. Every media buyer and seller should quickly take four-and-a-half giant steps to their nearest bookstore now, and buy this book that proves that behind the smoke and mirrors of selling, there is actually a true wizard behind the curtain." "Selling without Selling offers innovative ideas and practical blueprints that sales people can use to close more sales with less effort. Just a few of the ideas contained in the book can lead to quota-busting results." "Carol Super's easy-to-understand 4½ steps will make you a better salesperson." "I'm sold, and I didn't mean to be. After 10 years in sales  and reading more than a few books on selling  I was skeptical. The book's power rests in its unobtrusive, common-sense approach: treat your prospects like you would a friend  understand them, speak their language, and be a partner in achieving their goals. Sounds easy, and it is...if you have the right tools. It's all there in the pages, the answers revealing themselves through the book's friendly and simple style. The book's best achievement is in living up to its title: you will be sold before you ever realize what happened." "Selling Without Selling  even if you're not selling!! Anyone in public relations of any kind needs to read this book! I am not in sales, but found every page full of information that will be helpful to me as Executive Director of a non-profit organization. The book is light-hearted and fun to read, and the reader learns (without learning)." "Selling Without Selling is a great tool for success! I love all the quotes and references made from some of my favorite authors (i.e. Deepak Chopra, Tony Robbins and Dr. Wayne Dwyer). This an absolute must for sales people and anyone striving for success! Looking forward to the next book!" "The book was a fun read. I thoroughly enjoyed it. And that's why I want you on my radio program. "As a new person to the ad sales business, I found your book very beneficial. I pick it up and reference it all the time. It's really great." "As executive editor of Incentive Magazine, I see a multitude of business books come across my desk and I have to review many of them. Selling without Selling: 4 1/2 Steps to Success! was a refreshing change. It was an easy read and I really got a lot out of your unique ideas on rapport building." "Two days after I began using the Selling without Selling system, my boss was told by my latest customers that I was the most professional sales person they had ever met. Thanks for making me look good!" "I really enjoyed Selling without Selling: 4½ Steps to Success! I could NOT put it down. It flows so well  and an easy read  and so much good stuff in there. It has loads of useful information for a salesperson. I especially enjoyed chapter 10!"